Building Creative Bridges: Integrating Service-Learning into the Initial Teacher Education Program, in Initial Teacher Education: Enriching and Extending Partnerships (Ed. C. Rolheiser), OISE/University of Toronto, 2008. Integrating Service-Learning into the Initial Teacher Education Program, in Initial Teacher Education: Enriching and Extending Partnerships, OISE/University of Toronto, 2008. Building Bridges utilized a service-learning model to strengthen relationships between arts-based associate teachers, our teacher candidates and OISE/UT instructors. By integrating course content with community service and critical reflection, our teacher candidates were able to deepen their own knowledge and experience in arts education by working in extracurricular arts program across the city. These placements benefited the schools through an infusion of volunteers, better connected the associate teachers to the Initial Teacher Education program, and improved our teacher candidates’ professional experience in arts education. Service-learning has helped to build broader and deeper connections between our teacher candidates, our partners and ourselves, and should be further explored in the Initial Teacher Education program in future. Service-learning is a recent addition to many university courses in Canada. Utilizing a combination of community service, course material and reflection (Taylor, 2002) students are offered a unique means of learning that takes allows them to apply course content in a practical way through community-based service. At the University of Toronto, the growing popularity of service-learning is reflected in the establishment in 2006 of the Centre for Community Partnerships, which actively encourages faculty to incorporate service-learning into their courses. This research project was designed to do just that - to explore the implications of service-learning in the context of arts-based courses in the Initial Teacher Education program at OISE. Service-learning has a long history south of the border; some American colleges have included it as part of their curricula as far back as 1930s (Taylor & Ballangee-Morris, 2004.) And while many Canadian universities have long histories of volunteerism, fewer have incorporated service-learning into their formal curricula. According to California State University, “service learning is a teaching method that promotes student learning through active participation in meaningful and planned service experiences in the community that are directly related to course content.” (quoted in Jeffers, 2005, p. 29). In this, service-learning is somewhat different from the practica experiences our teacher candidates undergo as part of their teacher education; practice teaching is on-the-job training, while service-learning has a strong emphasis on developing students’ civic responsibility in the context of being a reflective educator. This inquiry investigates the suitability of the service-learning model for the arts courses in the Initial Teacher Education program. It also provided a means to continue to build relationships with arts-based teachers in our existing partner schools, (a continuation of our School-University research project from the previous year). Our assumption was that the service-learning model would provide a valuable way to develop and/or strengthen these relationships, in turn improving arts-based learning experiences for our teacher candidates. We aimed at placing our teacher candidates in extracurricular arts programs in partner schools or community centres to learn from experienced arts teachers over an extended period of time. Our teacher candidates would benefit by gaining hands-on experience in arts education programs from experienced educators, while the teachers and students in the partner schools would benefit from an infusion of our teacher candidates’ artistic skills, energy and enthusiasm into their extracurricular programs. Building bridges between teachers and teacher candidates. 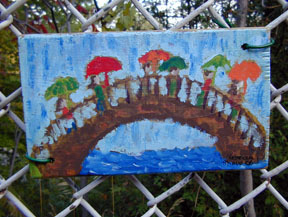 In September 2006, we began to identify associate teachers with extracurricular arts programs who might participate in the study; five teachers joined the study as teacher collaborators, while three more schools and two community centres provided access to their programs for our candidates. Once our teacher candidates arrived on campus, we invited them to join the study as well; in all ten volunteered to participate. Teacher candidates were assigned to work with arts teachers based on their interest in the program’s theme, its geographic location or the scheduling of the program. Prior to starting both teacher candidates and the teacher-collaborators completed a pre-program questionnaire. Building bridges with students, school and community centres. In October, the teacher candidates headed out to our partner schools to help run a wide variety of extracurricular arts programs. Some were located in inner city schools or community centres, while others ended up in private school environments. They were required to work for a minimum of six weeks, but some volunteered to stay longer (a reflection of their engagement with their placements.) They worked on a diverse set of projects, from a mural project for St. Michael’s hospital, to a clay club run by secondary students, to the One World composition and recording studio music program in a public high school. They worked alongside the collaborating teachers, built relationships with the students, and became integral members of the clubs in which they were involved. After their involvement ended, they were asked to write reflections on their experience and complete a final questionnaire. Building bridges with the Initial Teacher Education program on campus. We invited our teacher collaborators back to campus for our annual elementary arts conference in January 2007. They led experiential arts workshops for our generalist teacher candidates, sharing their expertise in the visual arts, music, literacy and dance. They also had an opportunity to learn more about the initial teacher education program firsthand, and meet with other arts instructors in the program. In the spring they returned to campus to participate in focus group interviews to solicit their perceptions as to the service-learning model in the context of the Initial Teacher Education program. Can service-learning be used to deepen the educational experience of arts education majors in the Initial Teacher Education program? Can service-learning projects build stronger bridges between the Initial Teacher Education program and our partner schools? What can service learning offer Initial Teacher Education teacher candidates and faculty on the one hand, and teachers and students at partner schools on the other? What are the benefits and drawbacks of arts-based service learning projects for the Initial Teacher Education program? The study provided a rich set of data from the questionnaires and interviews with the teacher collaborators and the teacher candidates. Data from the questionnaires and focus group were thematically coded and analyzed. All of the teacher collaborators were overwhelming positive about their participation in this project. They found the service-learning model to be of benefit to their extracurricular programs on a variety of levels. They appreciated the extra set of hands the teacher candidates provided; this meant an increased level of individual attention for their program participants. Echoing the feedback from many of the teachers, one commented, “My students were very positive and voiced on several occasions how helpful it was to receive the extra attention and support.” Another confirmed this: “The experiential nature of [our program] requires time-intensive, one-on-one work with the instructor. Having the teacher candidate participate in some of these collaborations was of tremendous benefit.” Many of the teachers described the growth and learning the teacher candidates demonstrated over the course of the program, but interestingly also noted their own learning. One said, “I’ve learned something myself … [the teacher candidate] is a really fine bass player and he was able to teach me. I learned a lot about different ways to teach bass. He made a real contribution to the school.” This same sentiment was heard about the teachers’ involvement in Arts Day. They were delighted about the response they received to their workshops, and enjoyed meeting others involved in arts education at OISE/UT. One noted that “it was very beneficial delivering the training to a whole range of our teachers and teacher candidates...I learned a lot from working with you and the other people here.” And while many described the advantages they saw in the learning model, not one expressed any drawbacks or apprehensions about this approach to learning and community service. Building Bridges has lived up to its name; it has helped to build broader and deeper connections between arts-based teacher candidates, our partners in the community and OISE/UT instructors. Our assumptions around the benefits of the service-learning model have proved well-founded; in the context of this research study this approach has proved to be successful in not only better connecting these groups, but also in linking our course material to field experiences for a greater good. Service-learning brings benefits to all participants – teacher candidates, associate teachers, students and OISE/UT instructors – in terms of enhancing learning, increasing self-confidence and strengthening relationships. It has also helped to manifest the Initial Teacher Education program’s initiatives in social justice work as well as support the value of arts education programs in schools and community centres across the city. In this, service-learning has proven to be a valuable addition to our arts courses in teacher education. This research study supports a growing body of literature that acknowledges the benefits of service-learning in the arts in school and university environments (Edwards, 2001; Barnes, 2002; Taylor & Ballangee-Morris, 2004; Jeffers, 2005). We have experienced these benefits firsthand and are convinced of the value of the service-learning model in the context of curriculum-related courses in teacher education. Our candidates were able to witness and participate in the power of extracurricular arts programming in school and community settings in developing students’ skills and knowledge and in enriching their lives. For many students, it is in these programs that they find a degree of success and fulfillment not found in the course of their regular school day. The implications of implementing service-learning on a larger scale throughout the Initial Teacher Education program could be profound. Our connections with associate teachers and their communities would be strengthened, our students would leave with a richer set of teaching experiences and better developed resumes, and our mandate of social justice will have been supported throughout our community. Strengthening relationships with associate teachers better connects them to the goals of our program, helping to ensure a stronger connection between theory and practice in our program. This could potentially improve the quality of our teacher candidates’ practica experiences, as well as provide an alternate means for our candidates to hone their teaching skills in non-evaluative settings, where they have more latitude to experiment with alternative pedagogies and curricula. And supporting our social justice mandate not only provides tanglible benefits to our community, but also demonstrates the importance of volunteerism for teachers and students alike: it better connects teachers with students, providing a means for them to develop and deepen relationships outside of the classroom. Given the success of this pilot study, we expect to expand the number of participating teacher candidates and associate teachers involved in the service-learning program next year. We would like to broaden the range of sites our students can access, and encourage them to stay involved over the full course of a term or the academic year. Identifying the optimal length and characteristics of service-learning experiences will be questions we will be tracking over the next few years. We will also be sharing these results with other instructors in our program in hopes of encouraging them to incorporate service-learning into their own courses. Broadening the implementation of service-learning into a range of different subject areas would help to spread its benefits beyond the arts into all facets of city life – imagine the power of sending 1300 volunteers from our program into underserviced communities throughout the Greater Toronto area each year! In the future, we would also like to investigate the possibility of establishing our own arts education programs on campus for needy children in Toronto. Inspired by similar projects run by American teacher education programs, we could provide the leadership to establish programs that would not only provide a rich training ground for our arts-based teacher candidates, but would also serve children in need in our own community. As one of teacher collaborators so beautifully articulated: “These initiatives taken by OISE are paramount in reframing the way we perceive education and the arts. The arts are tools for building healthy individuals and strong communities. They are the stories, rhythms, and illustrations that make us who we are, celebrating our difference and communicating a shared experience. The arts are our common ground”. We hope to continue to grow arts-based initiatives in the fertile ground of service-learning in the years to come. We would like to thank the five research partners (listed above) who collaborated with us on this project, as well as other educators who hosted our students in service-learning: Julie Frost, Linda Blix and Jennifer Chin (all from Arts for Children of Toronto); Silvana Michetti, Jim Lemoire, and Janet WIlliamson (all from the University of Toronto School); Laura Brown-Bowers (Sprucecourt P.S. ); and Rayma Hill (Parkdale P.S.). We would also like to thank the teacher-candidates involved for the energy and creativity they brought to this project, all of whom continue to inspire us in our ongoing learning in arts education. Barnes, G. (2002). Opportunities in Service Learning. Music Educators Journal, 88(4), 42-46. Edwards, S. (2001). Bridging the Gap: Connecting School and Community through Service-Learning. The English Journal, 90(5), 39-44. Jeffers, C. (2005). Spheres of Possibility: Linking Service-Learning and the Visual Arts. Reston, VA: National Association for Education Through Art. Taylor, P. (2002). Service-Learning as Postmodern Art and Pedagogy. Studies in Art Education, 43(2), 124-140. Taylor, P. & Ballangee-Morris, C. (2004). Service-learning: A Language of “We”. Art Education, 57(5), 6-12. Leslie Stewart is a Lecturer at OISE/UT. Her teaching and research interests focus on arts education and preparing preservice teachers to work in inner city contexts.